Beautiful home in a quaint seaside village. Parking was available in a secure garage. It was a long way up to reach the apartment but you will forget the tiredness as soon as you see the perfect view of Manarola as you step in the terrace. The 4 of us stayed at apartment Fregagia, just next to the famous Trattoria de Billy where we had the best meal of our Italy trip. The little kitchen is fully equipped, 2 comfortable double bed bedrooms & 2 clean bathrooms with great shower. The best part is the view of the terrace is beyond & magnificent, we listen to the waves & birds & watched sunrise & sunset there everyday of our stay. It’s super relaxing here. Thank you all staff & management of Arbaspaa. The view was absolutely gorgeous. It was right beside a restaurant. It’s only a 5 minuet walls to basically everything. Loved the view. Nice apartment and responsive host. A lot of climbing hills and stairs. 2 large bathrooms with showers...unique shower had ‘lit cave’ The views were out of this world!! Cinque terra is wonderful! We really liked Manarola!!! Stefano even helped us with our bags going up the hill! Staff tried to respond to our concerns in a timely manner! Beautiful apartment. Very clean and spacious and well designed. The view was lovely. The view from the large patio was amazing. Parking was easy in the garage that was previously arranged. Lock in a great price for Luxury Seaview Apartments Manarola – rated 8.5 by recent guests! Located in Manarola, Luxury Seaview Apartments Manarola has accommodations with free WiFi. There's also a kitchen in some of the units equipped with a dishwasher, an oven, and a toaster. La Spezia is 10 miles from the apartment. The nearest airport is Galileo Galilei Airport, 63 miles from Luxury Seaview Apartments Manarola. When would you like to stay at Luxury Seaview Apartments Manarola? This apartment features a dining area, view and air conditioning. 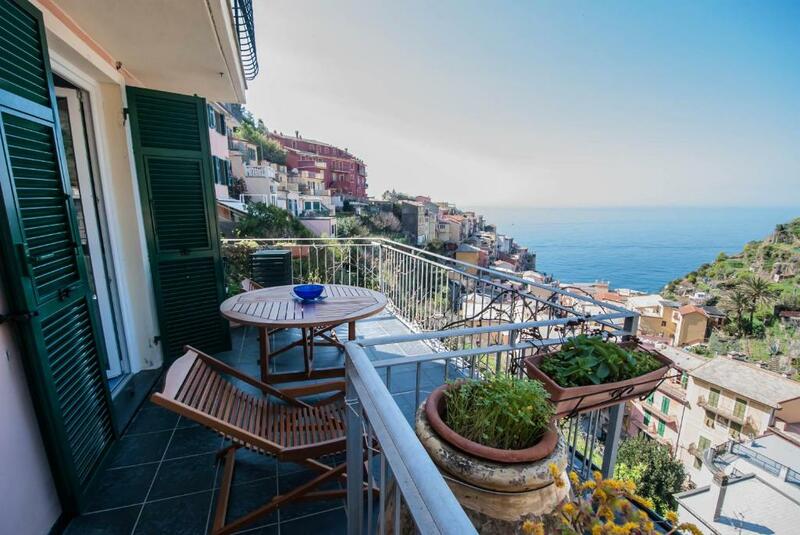 Amazing and very exclusive apartments with sea view in the heart of Manarola! Born in 1975 grew up in the Cinque Terre, a unique scenic monument created by the manual skills of whole generations; in the 90s university studies at Florence - which in those years was the most international town imaginable for young people - a colorful mix of dozens of languages and lifestyles. The respect for the work of his ancestors and the fascination he finds in the meeting of several points of view are some of the deciding elements for the foundation of Arbaspàa Tour Operator in summer 2001. The valorization of the work of our suppliers and colleagues on one side and the great attention to the expectations of the clients on the other are the two main columns of his work. The Cinque Terre "The Five Lands" comprises five villages with steep landscape right up to the cliffs that overlook the sea: Monterosso al Mare, Vernazza, Corniglia,Manarola, and Riomaggiore. The surrounding hillsides are all part of the Cinque Terre National Park and are a UNESCO World Heritage Site. House Rules Luxury Seaview Apartments Manarola takes special requests – add in the next step! Luxury Seaview Apartments Manarola accepts these cards and reserves the right to temporarily hold an amount prior to arrival. Please note, the apartments are reachable via several steps. Please note that check-in and key collection take place at: Via Discovolo 204, Manarola 19017. Please inform Luxury Seaview Apartments Manarola of your expected arrival time in advance. You can use the Special Requests box when booking, or contact the property directly using the contact details in your confirmation. The loft was fantastic in every way. Just a great place with stunning views. Coffee maker definitely needs an upgrade (only good for single servings). Very nice place. Big space and great view of Manarola and the sea. It was very good although it was a bit of a clime to get to it. Spacious and the view! For a big family group it was perfect, everyone had their own bathroom. Apartment was in need of a deep cleaning. Location was fantastic! Host was very helpful with directions and parking instructions. The cleanliness could have been better. The view from property was amazing! Slightly cold in the bunk room, the heater was on max.. although it was very cold at night. Beautiful spot on the hill over looking the ocean. Perfect place to relax and use as a base for hikes. There was no wifi available even when it was given in the facilities while booking. Other issue was with water heating .. the water was cold when ever we took bath so please look into these issues. Loved the view and the cosy n confortable rooms. It was 45 F while we were there and although the heater was turned on full the entire time we were there, the apartment was never warm. We were slightly cold and at night our children were cold in bed, despite the extra blankets. The hot water was also only moderately warm, we wished it was much hotter as the showers felt cold. We were only in our apartment for sleeping so it wasn't too terrible but it was cold. The location was beautiful. We had a wonderful view from our porch and the rooms were adequate for our family. We stayed in the winter and the home was a bit cold with no way to turn up the heat. Lots of bathrooms!! Beautiful views! There were lots of ants in the bathroom...outside table and seats were rusty, could not use them. Location was best to enjoy everything! The apartment comes with several “rules” that you should abide, some of which we’ve never seen before in this type of accommodation - not a BnB (e.g. taking out the garbage yourself, which in such a small vertical city can be very tricky; tidy up the place, not leaving the bathroom floor over flooded - whatever that means, etc). Well, when we first arrived we found the trash bins partially full, meaning the previous guests didn’t take them out neither the cleaning crew. The wi-fi didn’t work AT ALL, didn’t matter if we rebooted the modem or not (after several attempts as instructed during checkin). And last but not least, we found and killed 8 spiders in the apartment. I’m sure there’s a lot more. They were all very easy to spot and quite big frankly. Not to mention all the spider webs distributed all over the place (including inside the utensils cabinets). Aside of that, we were very happy with the stay overall. We listed all these items to the staff during checkout to which they seamed appreciative and sorry. This is just to be fair to new guests who we hope don’t have to experience some of those bad situations in such a good apartment and city.